From Portraits of Kalaupapa Residents by Father Joseph Julliotte, SS.CC. from this issue. 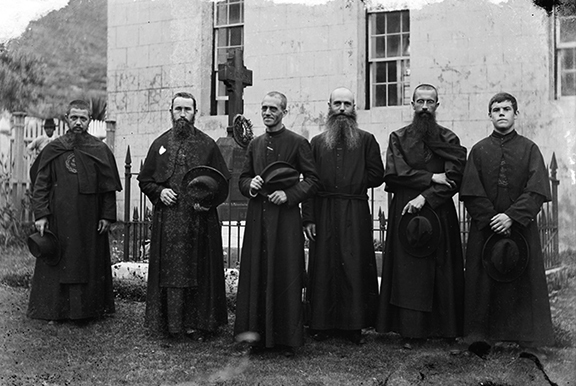 Fathers and Brothers of the Sacred Hearts of Jesus and Mary missioned to the Kalaupapa Settlement. Pictured left to right: Brother Sylvanus Van Volsem, Brother Aloysius (Louis) Leisen, Father Wendelin Mollers, Father Paul-Marie (Joseph) Julliotte, Brother Severin Baltes, and Brother Laurence Bergmans at the grave of Father Damien De Veuster, Kalawao, Molokai, 1902. Collection of Congregation of the Sacred Hearts U.S. Province. 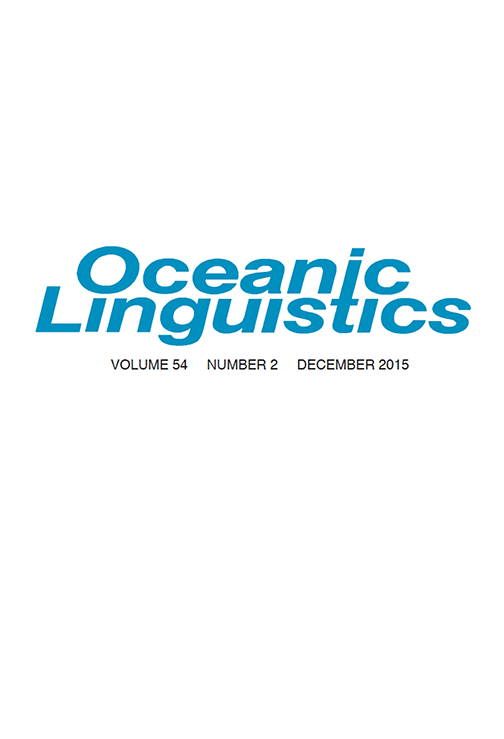 In the Notes & Queries section in volume 50 of the Hawaiian Journal of History author Stuart W.H. Ching writes about a collection of glass plate negatives housed within St. Patrick Monastery in Honolulu. …This archives contains the collective memory of a religious congregation of priests and lay brothers. Its members were the first Roman Catholic missionaries to the Hawaiian Islands, arriving in 1827. Historical records and visual images found in the Sacred Hearts provincial archives document the Congregation’s personnel and activities as well and that of the communities in which they served. Kalaupapa was one such community for which the Sacred Hearts Congregation left a written and visual record. The Hawaiian Historical Society will present an illustrated presentation as part of the launch of their new issue, The Hawaiian Journal of History Volume 49. Ronald Williams Jr. PhD, author of the lead article for The Hawaiian Journal of History volume 49. Ronald Williams Jr. PhD will discuss his article, “Race, Power, and the Dilemma of Democracy: Hawai‘i’s First Territorial Legislature, 1901,” this Thursday, March 10 at 7 p.m. at Kapiʻolani Community College, Hale ʻŌhiʻa. The event is free and open to the public. The struggle over political power in Hawaiʻi did not end with the American takeover in 1898. In the territorial election of 1900, Kanaka Maoli men and women, in a matter of less than six months, organized a new political party, campaigned against an oligarchic government supported by wealthy business interests, and achieved a convincing victory at the polls. What was the outcome of that legislature and why was this active display of Native leadership ignored by historians for over a century? The Hawaiian Journal of History Volume 49 is available digitally via Project MUSE and print issues can be ordered through the University of Hawai’i Press. Photographer Ray Jerome Baker. Courtesy Hawai‘i State Archives. Past histories of the Japanese experience in the Islands have emphasized “the reticent and subservient picture bride and the hard-working, silent plantation field laborer,” writes Kelli Y. Nakamura in her article “Issei Women and Work: Washerwomen, Prostitutes, Midwives, and Barbers.” While authentic enough, these characterizations are simplistic and fail to portray the wide range of activities performed by Issei women, according to Nakamura. Economic conditions enabled many Issei women use their skills as domestic workers to extend their influence outside the family sphere and create economic opportunities beyond the agricultural fields. Many found opportunities in traditional “women’s work,” such as laundering, cooking, and sewing. Others were active as midwives and barbers, two professions that were dominated by Japanese women, and some even out-earned men by working as prostitutes. According to Nakamura, these women rendered key services in the development of Hawai‘i’s economy, though their contributions have been overshadowed by the stereotype of the passive picture bride and industrious but silent field laborer. Race, Power, and the Dilemma of Democracy: Hawai‘i’s First Territorial Legislature, 1901 by Ronald Williams Jr. Published annually since 1967, the Journal presents original articles on the history of Hawai‘i, Polynesia, and the Pacific area as well as book reviews and an annual bibliography of publications related to Island history. The University of Hawaii Press is pleased to announce a partnership with the Hawaiian Historical Society to publish The Hawaiian Journal of History. Our first issue is Volume 48, 2014. The journal is not yet available online but Institutions may subscribe to the print issue by contacting the University of Hawaii Press. Individuals may subscribe by becoming a member of the society.